You are currently browsing the category archive for the ‘Jennifer Gregory Portz’ category. 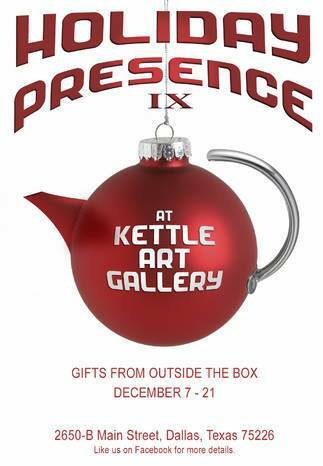 In this season of joyous celebrations, Kettle Art presents Holiday Presence #11, the gallery’s annual art and gift show featuring small works and unique, artisan-crafted pieces made exclusively by local artists. The exhibit runs through December 24. Watch for special announcements throughout the exhibit, artists collaborating on-site, updates on new items, impromptu parties, and extended hours. Artists include Richard Ross, Judith Lea Perkins, Brad Albright, Steve & Erin Reeves, Clint Scism, Miguel Aguilar, Jennifer Gregory Portz, Micah Rabalais, Justin Clumpner, Frank and Amber Campagna, Nick Glenn and more, with most pieces $100.00 and under. In light of the holiday gift-buying season, all pieces are cash (or charge!) and carry. Join us as we continue our mission of presenting the amazing local artists who make our art scene one of the most vibrant in the country! Due to the icy, slick conditions created around Dallas/Fort Worth late last week, Kettle Art Gallery felt it necessary to postpone the official opening of Holiday Presence IX. The staff felt that it was better for everyone to arrive safely to celebrate the holiday, than risk the potential of accident & injury trying to make it out for the show. The wait will be worth it as your favorite local artists will be on hand Thursday night to welcome one-and-all & officially kick-off Holiday Presence IX. So, join us Thursday night for what promises to be a jolly fun time for all! Till then, stay safe and warm! 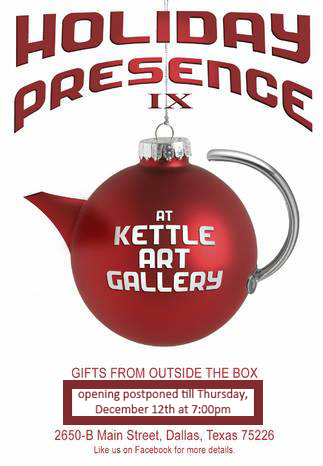 Kettle Art presents our Ninth Annual Holiday Presence exhibition, featuring affordable, unique, one of a kind gifts by local artists you know and love. Everything under $200.00 / most under $100.00. Artists include but are not limited to; Brian Crawford, Cabe Booth, Catrina Oittnen, George Wallace III, Guy Reynolds, Cheryl Baker, Mike Moffatt, Mandy Paquette, Justin Clumpner, Jodi Von Rotten, Mattson Plummer, Roxanne Mather, Brad Albright, Corey Godfrey, Raymond Butler, Jennifer Gregory Portz, Nick Glenn, Miguel Aguilar, Danny Rose and many more.